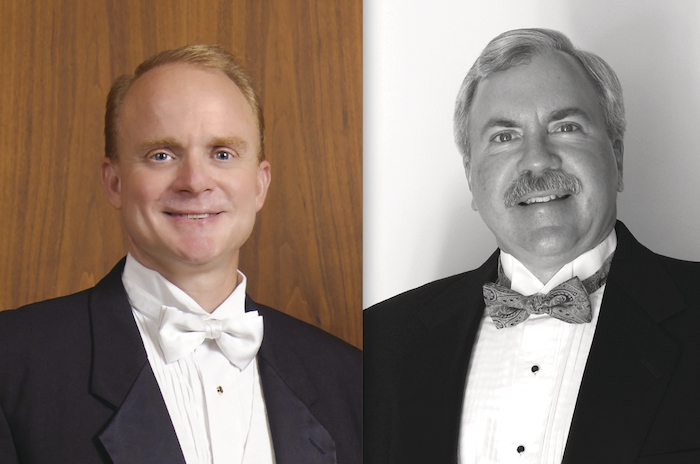 Conductors Richard Mark Heidel and Kevin Kastens will conduct the Iowa University Concert Band will be in concert on March 13 at GMIT Mayo. Two very distinguished conductors will visit Mayo during St Patrick’s week, to participate in what promises to be a superb evening of music, when the Iowa University Concert Band and the Mayo Concert Orchestra will perform on Tuesday next, March 13, in the GMIT Mayo Campus, Castlebar. Richard Mark Heidel is director of bands and professor of music in the School of Music at the University of Iowa where he conducts the symphony band, teaches graduate courses in conducting and wind band literature, guides the graduate band conducting programme, and oversees the University of Iowa band programme. Ensembles under Dr Heidel’s direction have performed at state, regional, and national conferences; he has led concert tours to Ireland and England as well as throughout the Midwest of America. Kevin Kastens is associate director of bands and director of the Hawkeye Marching Band. As a professor in the School of Music he teaches marching band techniques, band arranging, and conducts the concert band. He is active as an adjudicator and guest conductor throughout the United States and Canada. Prof Kastens has had numerous articles published on various topics of instrumental music education. He has served as a conductor/clinician for the Bands of America summer national workshops, the Smith-Walbridge Drum Major Clinics, and is a leader in the field of computer-assisted marching band drill design. The University of Iowa Ireland Concert Band comprises 50 musicians, the majority of whom are university students representing a wide range of majors including music, English, human physiology, and international studies. With all of their diverse interests and backgrounds, it has been their passion for music that has brought them together. Their concert programme is an enjoyable blend of American and Irish musical selections including "The Symphonic Gershwin", "Solas Ane", "The Rakes of Mallow", "The Green Glens of Antrim", "Declaration Overture", and "76 Trombones". The concert is presented by the Mayo International Choral Festival. Admission costs €10 for adults and €5 for u12s and tickets are available from Downtown Records in Castlebar and Westport or online from www.eventbrite.ie For more information call (086 ) 2658038 or (086 ) 3024170.